Fish the Snake River in Hells Canyon and Lower Salmon River. Bruce King is the owner-operator of Kingfisher River Trips. Inc. He operates a 28 foot twin engine Bentz boat. The boat is Coast Guard certified and inspected for up to 18 passengers. Bruce also holds a United States Coast Guard 100 ton Master’s License. King Fisher River Trips operates primarily on shallow, rocky, whitewater rivers. Bruce operated for ten years in Alaska on numerous rivers in the Denali region. He now concentrates on the Snake River in Hells Canyon between Lewiston, Idaho and Hells Canyon Dam, and on the lower Salmon River in Idaho. Kingfisher operates on Special Use Permits from the United States Forest Service on the Snake River and the Bureau of Land Management on the Lower Salmon River. Also is an equal opportunity provider and employer. Kingfisher River Trips is veteran-owned and operated. Bruce has always been drawn to wild places and he considers the Hells Canyon region the best place to experience the many miles of swift water, remote and rugged landscape, the history of explorers from Lewis and Clark through present time, and the legacy of the Native Americans who have been here for thousands of years. 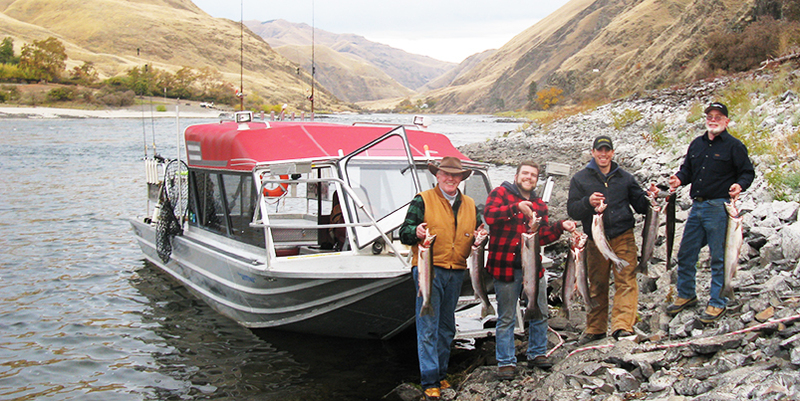 Kingfisher River Trips offers one to three day trips from his cabin in Idaho on the Snake River.